We’re heading off tomorrow to New York for the painting event at the NY Botanical Garden. I’ve been packing my kit, checking three times over to be sure I have everything. I bring the minimum amount of gear on an outing, but that means I can’t forget even one tiny thing. I leave my binder clips at home and suddenly I can’t paint! I’m so used to using the same setup every time. I find if I do a little sketch the night before a demo, then I know for sure I have all my usual tools. I should be painting some flowers or something! I’m a bit worried I’ll be the least botanically-savvy artist in the garden. But I didn’t have a perfect subject handy – so I thought – been a while since I did a portrait from the Sktchy app. Let’s do one just for fun. Here’s some still frames from a video capture. I’m getting pretty good at recording video :) but still a bit slow at processing it and getting it out to you. The editing and voice over is creating a little blockade. So the full video is going into the bank till I have time to get my backlog handled. This sketch is a classic application of my mantra: Tea, Milk and Honey. 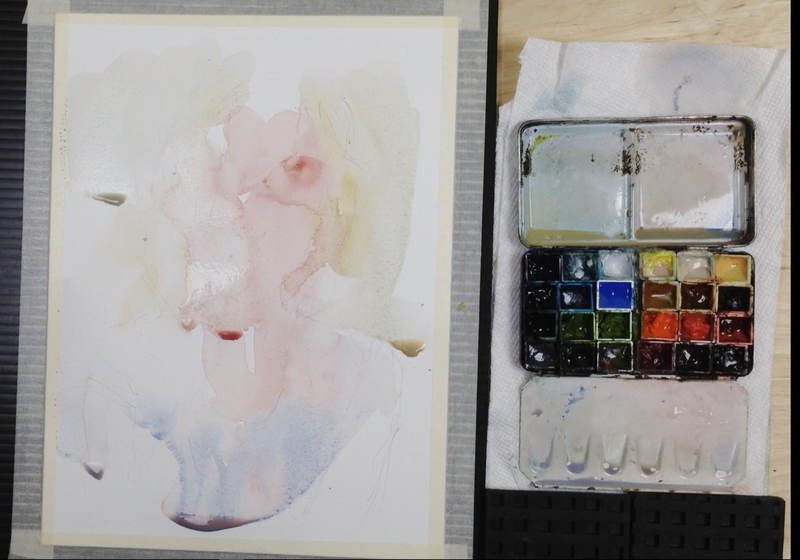 I’ve started the head with wet, diluted, washes of Perlyne Maroon, mixed with Buff Titanium, Naples Yellow, and a new blue I’m testing – Daniel Smith Verditer Blue (PB28, PB36, PW4). The white cotton shirt is the same mix, in reverse proportions. 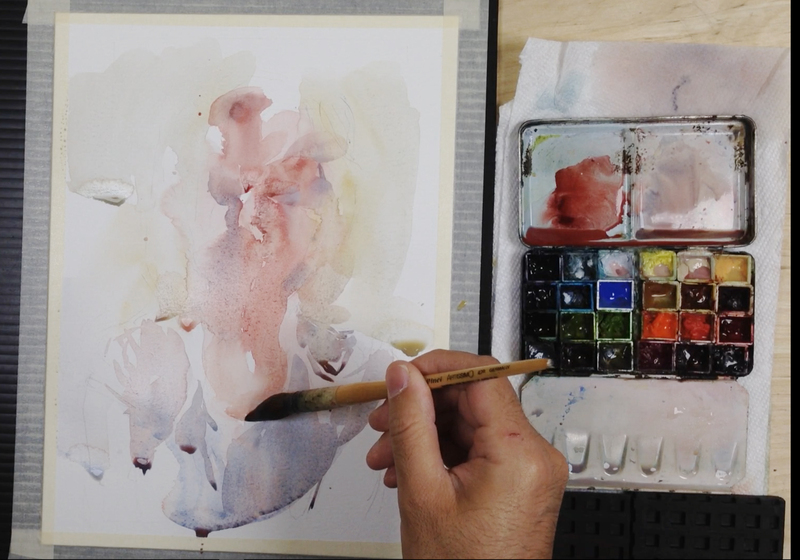 This keeps a harmony in the sketch – and captures the transmitted color of skin underneath a thin t-shirt. In my first wash I’m looking for a fuzzy silhouette of the lightest local colors. These days I’m trying to restrain myself as much as possible in the first pass. It should be a fuzzy, light filled shape, with no detailed drawing. I always want to get to the details immediately. But you have to delay that gratification. After allowing the first wash to dry, I can begin to lay Milky pigments over top of my transparent Tea. Sometimes I’ll draw in a form like these lips – then lift or blend parts of it – to soften it into the under-painting. I’m always trying to see how little I can draw. I’m trying to do more with incomplete shapes. Leaving gaps of under painting, that bridge a distance between darks. Rather than literally drawing on the features – just imply their small shadows. As the darks on the face begin to build up, I transition to Honey mixes – less water, more pigment. Also using darker colors such as Raw Umber Violet and Indigo. Essentially the same Magenta/Blue color harmony, but one notch darker in tone, and with less saturation. The darkest darks are in the shadow under the hair – right behind the neck – and the pupil in the eyes. And the last touch is a few dots of Grey of Grey in the (not quite) whites of the eye. It’s never pure white – that would be too strong. So, no philosophy today! Just a simple sketch, trying to capture the softness of a young woman’s features. Beautiful work and wonderful information for anyone serious about field work. Good Morning Marc! I love to read your musings as well! I LOVE the portrait! Actually you have painted the essence of a beautiful flower in this young girl’s face! Can’t wait to see your Botanical paintings! hope to see the iconic bridge in one of them! you won’t need to be botanically savvy because you are an artist and you are paint and brush savvy! Wow! I am seldom at a loss of words but words do not, canno describe the excellence of this work of yours. Thanks for sharing. Mark, there are two areas of the garden with “flowers”. One is the rose garden and it is in full sun (expected to be 90 on Sunday). The other area is in front of the conservatory, which is lovely, but cramped. The rest of the garden is vast, with some water scenes and a beautiful stone mill, as well as trees of every kind. There are also areas with rock croppings. So… don’t think of this as a flower garden if you are not inclined. Haha, thanks :) I’m just having visions of all those amazing rose painters or those hyper detailed botanical artists :) But of course it’s not a competition. I’m just having fun getting ampe up to paint. But yes, In fact there is a Chihuliy exhibition that is the ‘theme’ – so we’ll each be assigned a space that includes one of his sculptures. So there is always that for a motif. Will there be an app, or a list of where all of you will be stationed? and BTW, there weren’t many that would be considered botanical artists , last year. Shari maybe. A bunch of us from the NYC Usk will be there to annoy, I mean say hello, you. 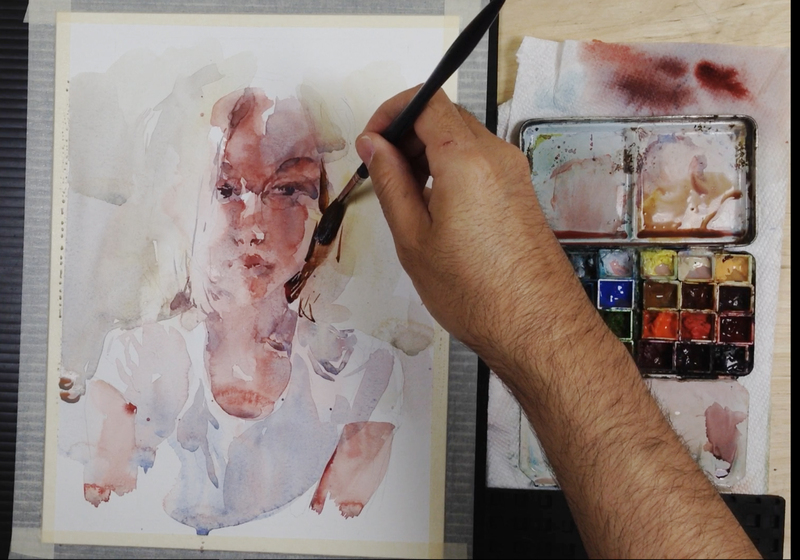 Thank you for providing some insight into your process with these portraits. You are so talented. Marc, and I’m very appreciative of how much you generously share. The portrait is gorgeous. You make it seem simple but I know it comes with years of practice and perfecting your craft. safe travels, Marc! 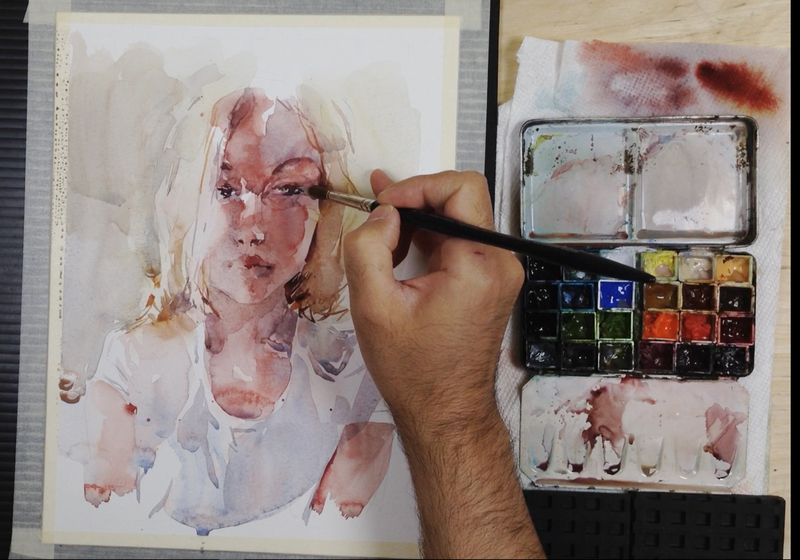 And thank you for sharing your process in this portrait. 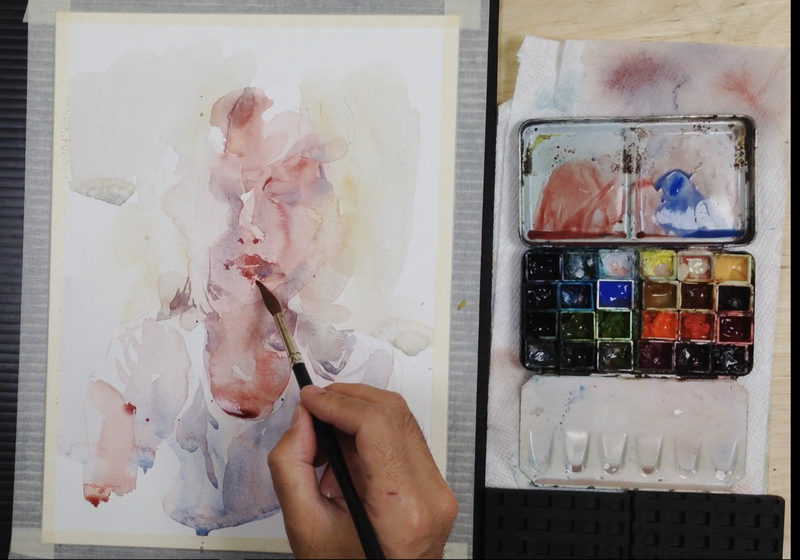 Love this portrait, and seeing your process helps me in thinking about my nature journaling. 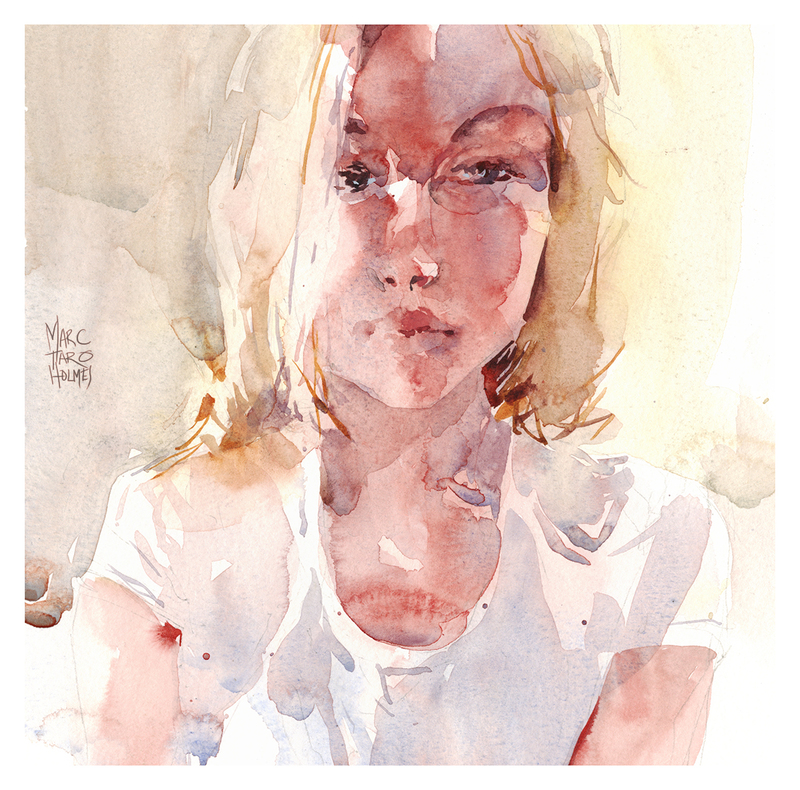 Marc, Your loose, luscious portrait is so gorgeous. I love your color choices and the ease (from much experience, I know!) 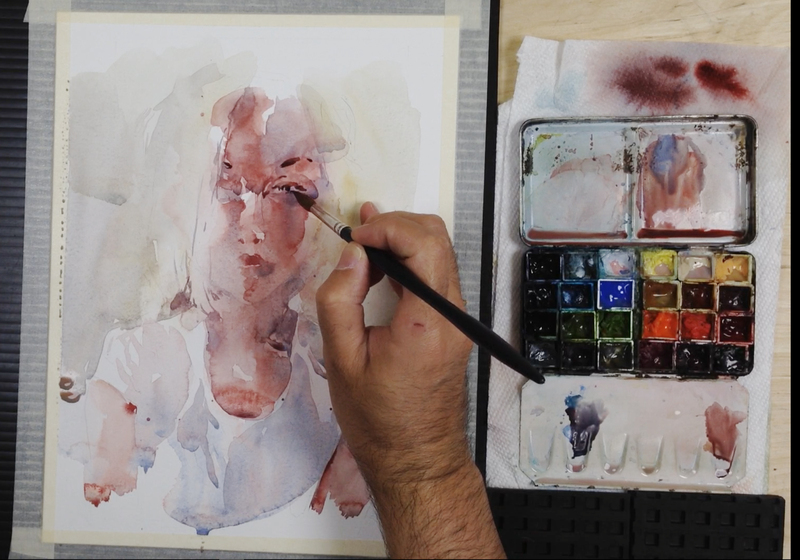 of your brush strokes, which showcase the magic of what watercolor can be when handled the way you do. I look forward to seeing what you painted at the garden!